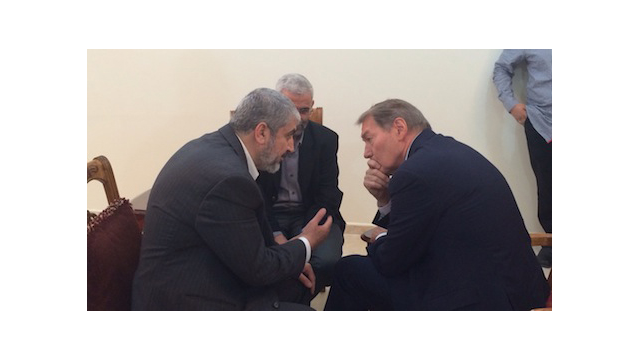 NEW YORK and ARLINGTON, VA; July 27, 2014—In a U.S. broadcast exclusive, Charlie Rose’s interview with Hamas leader Khaled Meshaal will be broadcast on Monday, July 28, at 11:00 PM ET/PT (check local listings) in a special presentation of CHARLIE ROSE on PBS. Portions of the wide-ranging interview will be broadcast on FACE THE NATION WITH BOB SCHIEFFER today, Sunday, July 27 (10:30 AM), and on CBS THIS MORNING on Monday, July 28 (7:00 AM) on the CBS Television Network. The PBS broadcast will be the only place to see the interview in its entirety. Rose traveled to Qatar for the hour-long interview, where he spoke with Meshaal on July 26. Portions of the interview will be available via CBS News and PBS digital platforms. CBS News is the news and information division of CBS Corporation, dedicated to providing the best in journalism under standards it pioneered at the dawn of radio and television and continues to set in today’s digital age. Headquartered in the CBS Broadcast Center in New York, CBS News includes bureaus across the globe and compelling, influential programs providing original reporting, interviews, investigations, analysis and breaking news 24 hours a day, seven days a week. CBS News utilizes a multi-platform model for news distribution across television (CBS Television Network), radio (CBS Radio News), the Internet (CBSNews.com) and hand-held devices (CBS Mobile). CBS News is home to the critically acclaimed, award-winning programs 60 MINUTES, CBS EVENING NEWS WITH SCOTT PELLEY, CBS THIS MORNING, 48 HOURS, FACE THE NATION and CBS SUNDAY MORNING.